Place the flour, flaxseed, sesame seeds and dry yeast in a large mixing bowl and mix until well combined. Slowly add in the honey and water, keep mixing as you go with an electric mixer until you reach a dough consistency. Sprinkle some flour on a cleaned work surface, then knead the dough until you have a firm ball. Place the dough in a large bowl, cover with a kitchen towel and leave for 1-1 1/2 hours. (Until the dough has doubled in size). Grease your loaf tin with coconut oil. Once the dough has risen, remove it from the bowl and place it in your tin. I sprinkle the top of mine with a few more sesame seeds (but this is optional). Slice a few cuts on top of the loaf and then cover with a kitchen towel again for another 30-40 minutes, to let it rise again. Bake the loaf in the oven for 20-25 minutes, then leave out to cool for 10 minutes before slicing and serving. 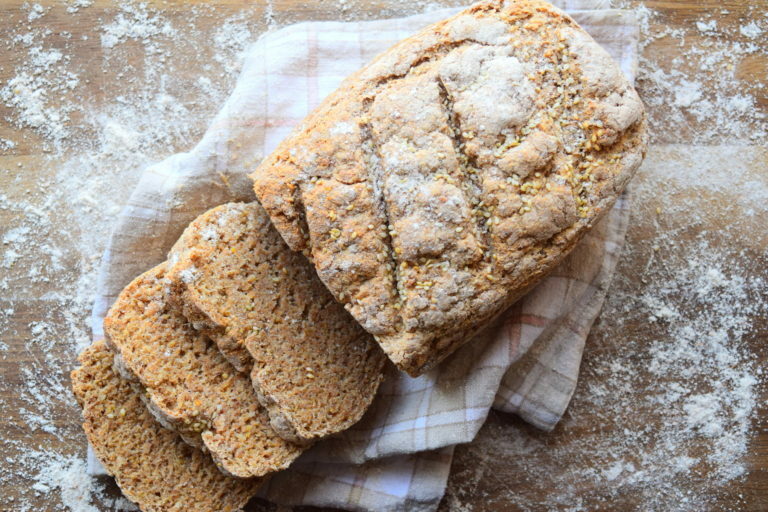 It really is the simplest bread recipe you could make, you do need to be patient whilst waiting for the dough to rise, but there’s nothing to it at all, it’s almost impossible to get wrong. Whilst you’re waiting for the bread to rise, you can use the time wisely too to prepare something else. This delicious lentil soup recipe http://www.mynutricounter.com/recipe-lentil-soup/ is my favourite soup to dip the bread in, but you could also try making other accompaniments like: almond butter http://www.mynutricounter.com/recipe-almond-butter/, strawberry jam http://www.mynutricounter.com/recipe-strawberry-jam/, or lemon curd http://www.mynutricounter.com/recipe-lemon-curd/, which all taste great spread on top of a slice, and make a fantastic healthy snack. Spelt has a delicious nutty flavour too and has less gluten than other flours so it’s easier to digest (it’s not completely gluten-free though). 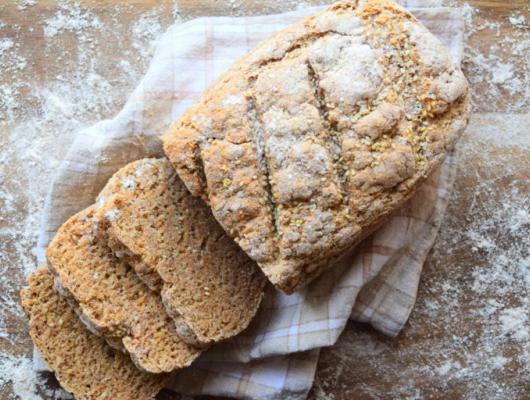 If you’re looking to make an easy, homemade and healthy loaf of bread, that’s also cheap to make, then this is the recipe for you.